Dream Boards: Be inspired by hundreds of photos from real Disney weddings. Whether you're planning a fairy tale celebration or a modern soiree, pin any photo to your dream boards by clicking the "Love It" button in the top right corner of the photo. Dream Colors: Mix and match color palettes from the color wheel to find the perfect combination of hues for your big day. Bridal Boutique: Browse through products inspired by Disney's Fairy Tale Weddings. You may just find the perfect touch to add some Disney magic to your big day. Destinations: Find detailed information on the Disney's Fairy Tale Weddings global destination portfolio. This is your one-stop-shop for details on Collections, venues, pricing and more. 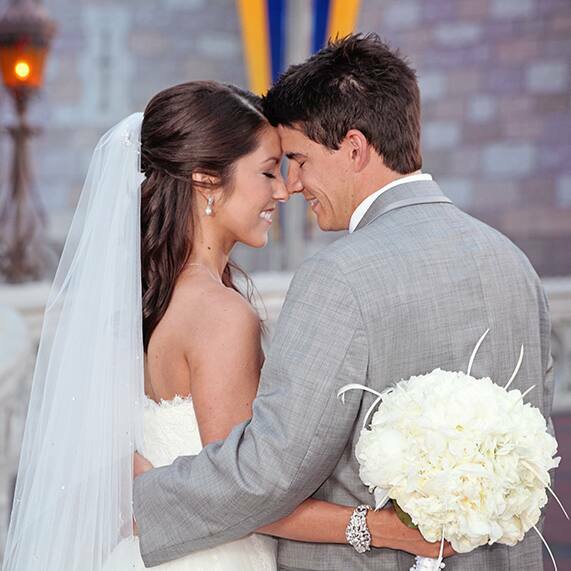 Dream Wedding Maker: Create a rough draft of your dream Disney's Fairy Tale Wedding. Choose from destinations, venues and enhancements to configure your big day. If you're within the booking timeframe, you can even request to speak with a Disney Wedding Consultant about a configured wedding.